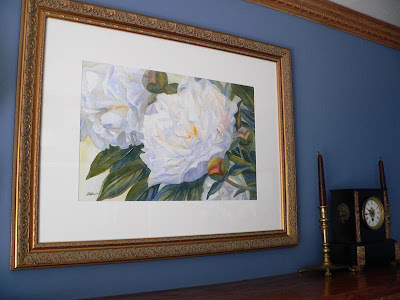 The above watercolor is the newest addition to Evelyn's collection: white peonies blooming in the garden. I love the frame she has chosen for it and how well the painting complements the deep blue wall behind. Thank you Evelyn for sharing. It's delightful to see this painting in its new home! You can click on the picture to see it larger. Evelyn has a wonderful collection of Zeh Original Art paintings going back to some of my first pieces. This sample includes works from about ten years ago to the present. All are watercolors except the large painting of white ibis in flight which is acrylic on canvas. We are so pleased that she has shared part of her extensive collection with us!